There are various versions of the impact theory. All are supported by the fact that the composition of the moon has been found to be almost identical to that of Earth. 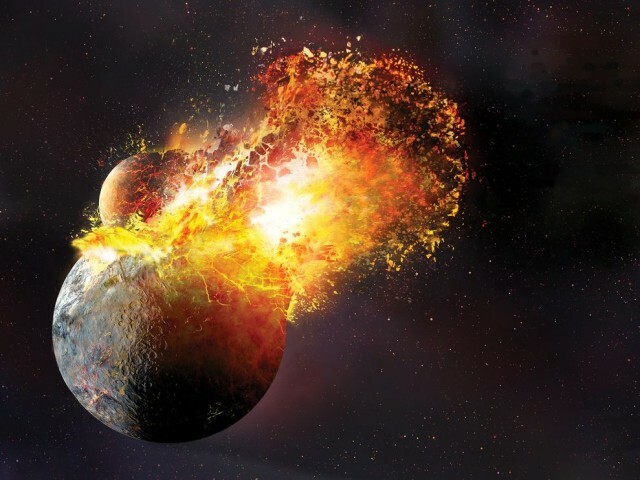 The theory also suggests a small iron core for the moon because the impact would have thrust material mostly from the surface. Most of the Earth’s iron was already concentrated near the planet’s core. Contemporary analysis of the moon indicates that it, indeed, appears to have a small iron core. When the Earth was nothing more than a proto-planet, still in its early stages, it was called Tiamat which was in orbit beyond Mars. Its moon, called Kingu, had been developing and was almost ready to break away from Tiamat to become another planet in the solar system. When the wayward planet Nibiru was making its pass through this solar system, one of its moons known as The Evil Wind slammed into Tiamat, breaking it into two parts and sending them into a new orbit. One half of Tiamat, which remained intact as a solid body, became the Earth. Kingu followed along and became its moon. The rest of Tiamat was shattered into the asteroids that make up the belt of rock particles also orbiting the Sun. Rocks collected during the Apollo Moon landings showed oxygen isotope ratios that were nearly identical to those of Earth. Also the composition of the lunar crust suggests that a large part of the Moon was once molten. Researchers say that a giant impact at that stage could have supplied the energy needed to form a magma ocean. Another theory is that a planet the size of Mars struck the Earth about 4.6 billion years ago. This planet has been dubbed Theia after the name of a Greed God. On impact Theia was partially absorbed by the Earth. A large amount of debris also was sprayed out into space where it was pulled together by gravitational pull to form the moon. Astronauts who visited the moon reported that it looks like a small planet in the process of forming. Its surface contains rugged mountains, plains and flat lowlands that might have become seas. Because of its depleted iron the moon maintains a weak magnetic field. The Sumerian text states that several planets in our solar system were once moons that eventually broke away from their mother planets to orbit the sun. Except that it fails to orbit the sun and lacks air and water, the moon appears to be a miniature replica of Planet Earth. It is easy to think of both Earth and Moon as being cast from the same mold. One is just larger than the other.